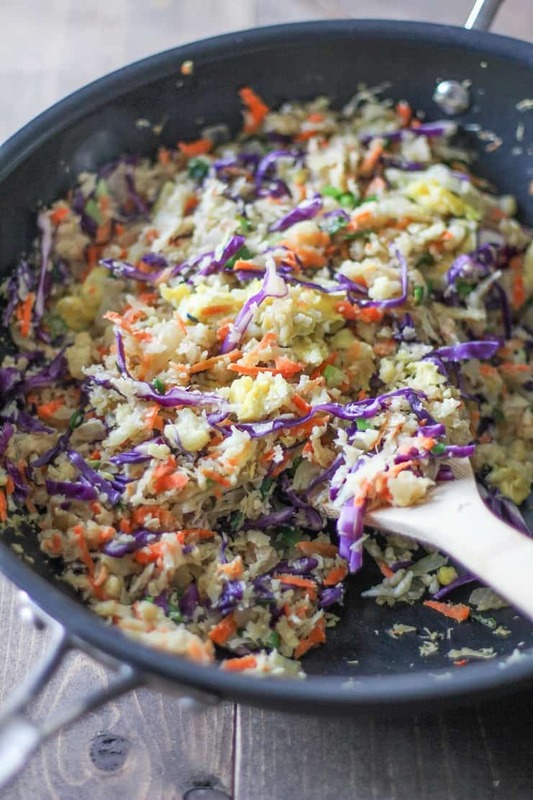 Paleo cauliflower fried rice made with, cabbage, carrot, green onion, egg, and more. This easy-to-prepare recipe is a healthful side dish (or meal!) of dreams! How was your weekend? It was sunny and 70 degrees where I’m at, so I spent much of the weekend outside, sunburning my eyebrows (I kid you not. I always forget to put sunscreen on my eyebrows, but it’s always worth the sting). 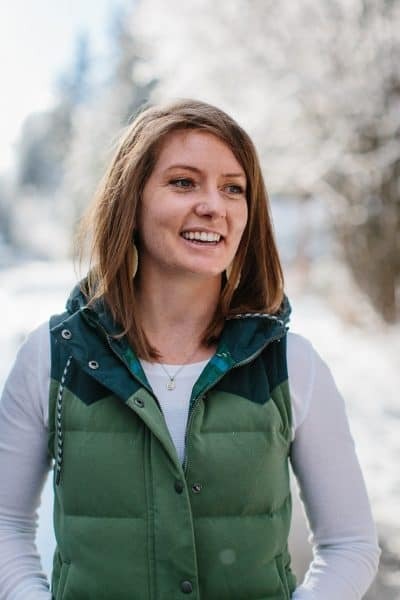 I went for a romp in the back country, ate a couple of pounds of Whole Foods salad bar, ran all the errands, and even gifted myself with a new nose ring. Chocolate was consumed, wine was drank, life is beautiful. When I was a kid, I loved when my mom came home from work with a box of Chinese takeout. I’d go straight for the fried rice and hoard it to myself while my brothers and sister settled for the chow mein, because what baby wants, baby gets (I’m the youngest. Can you tell? Spuh-OILD). As you know, I’m also a major fan of cauliflower rice, so I slammed the two concepts together and made cauliflower fried rice (which happens to be paleo-friendly). Fried rice is so enigmatically delicious it’s impossible to make at home, right? Wrong. It’s more simple than you’d think! 2.) Saute the cooked rice with some carrots, green onions, garlic, and peas with soy sauce and sesame oil. 3.) Scramble an egg or two. 4.) Add said scrambled egg(s) to the fried rice. Since we’re using grated cauliflower instead of rice, we get to skip step one and simply saute everything together in a big skillet or wok. I really think the scrambled egg is the clincher in this equation…it shalt not be skipped. Unless you have a deep-seeded hatred for eggs, in which case, skip away. Instead of using soy sauce, I prefer to use coconut aminos (same idea as liquid aminos), but either one will work just fine (just note that soy sauce is not paleo if you’re trying to be strict about it). I also skipped the peas and added red cabbage because peas aren’t my jam, but cabbage is. I’m thinking this cauliflower fried rice would go excellently alongside my Crock Pot Parsnip and Lamb Curry with Spinach, Fennel and Parsnip Stir Fry, or Spring Green Vegetable Stir Fry with Ginger-Lemon Sauce. In a small skillet, add about 1 tablespoon of coconut oil or butter and heat to medium. Add the eggs and scramble them using a wooden spoon, until fully cooked. Remove from heat, and set eggs aside. In a large wok or saute pan, add 2 tablespoons of coconut oil. Add the yellow onion and saute over medium heat until translucent, about 5 to 8 minutes. Add the grated cauliflower and garlic and saute, stirring occasionally until cauliflower has cooked down and begins turning light brown, about 8 to 12 minutes. Add the coconut aminos and continue to cook about 3 minutes. Add the grated carrot, green onion, cabbage, and cooked scrambled eggs and continue cooking just until the newly-added veggies are warm and green onion is fragrant, about 3 minutes. Serve as an entree or alongside your favorite entree. I still haven’t made cauliflower rice yet. I need to get on it! 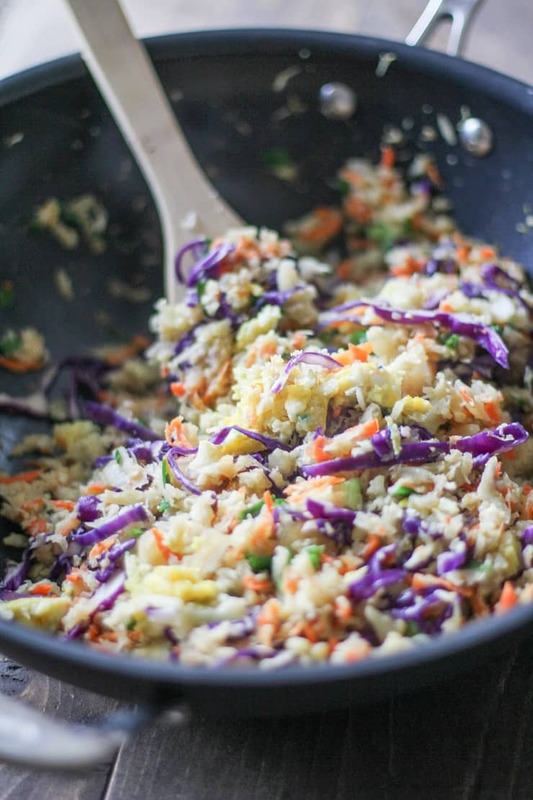 This looks so good, you are making me hungry for a big container of fried rice! 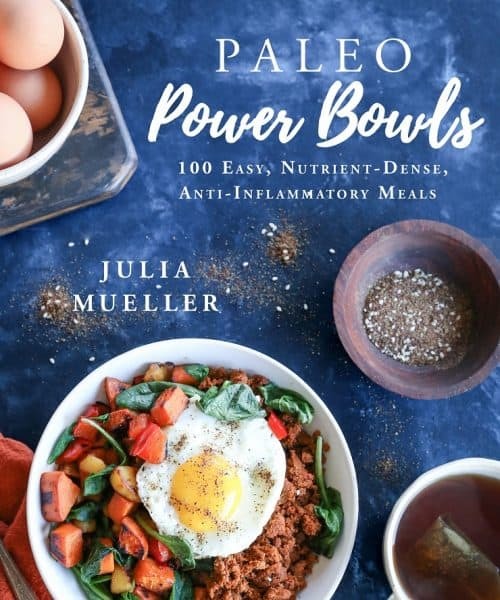 This looks delicious Julia – one of my favourites too! Sunny and 70 degrees?! I would die for weather like that right now. . it was so cold on Saturday here in Wisconsin, like -8. and I won’t even mention the wind chill. . anyway.. love this cauliflower fried rice! I’ve had something like this before and loved it! your dish is gorgeous! I am totally jonesing for the weekend you just had! And also for this fried rice situation, OBVI. Preferably both at once! The weather has been so beautiful lately! I’ve been wearing shorts outside and blinding everyone that I come into contact with because my legs are so white. Can your eyebrows give my legs some of their color please? 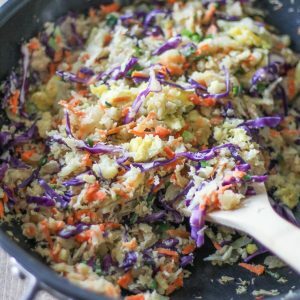 Speaking of color, I love that you thought to add cabbage to this recipe! I’ve made cauliflower fried rice and it was delicious but it didn’t feel satiating enough on it’s own. I bet the cabbage solves that problem and it looks pretty too! LOL, I love it! I realized after I posted the recipe, that I should probably have been more clear about the cauliflower actually being the rice. Le sigh..bygones. Love you guys and can’t wait to see you too!!!! this was my goto ‘carbs’ when i did whole30. i need to make your version soon!!! The weather has been very tough here in Canada. I spent my entire weekend at home because it was solo cold to be outside. Hopefully in march we will have better weather. I still haven’t made cauliflower rice yet. Do you believe that? This looks so good and beautiful. Thanks for inspiring me to get on the cauliflower rice wagon! Pinned!! I have been missing Asian food a lot since eating Paleo the past month and this sounds like a wonderful way to help with that. Pinned! The weather has been gorgeous around the Bay Area, too! Mid-Feb tan. How awesome is that?! I’m absolutely digging all the lovely colors in this fried rice! Our weather in Cleveland is less than desirable but this dish would make it all better! It looks so wonderful. Loved how it uses cauliflower! I sure do love skipping steps. Even more, I love cauliflower. Cauliflower all the things. Pass the sauté pan, please. You got it, girl. You’d love this cauli rice! I scrambled eggs into my pad thai a few weeks ago and now I’m OBSESSED with the concept. Scrambled eggs in everything! But especially cauli fried rice. Love it! We’re totally the same – I hogged all the fried rice to myself too! I’ve still never made cauliflower “rice” but this dish sounds so simple and easy to make that I’m definitely going to make it a weeknight dinner soon! So glad you made and enjoyed it! My egg actually did turn blue after it had sat for a while. I took the photos immediately after mixing everything together, so the cabbage didn’t have a chance to work its blue magic yet 😉 Thanks for the sweet note!